Today was glorious... sun shining, birds chirping, children laughing and splashing in the paddling pool. Long may it last. It was the perfect day to try out the Vichy Capital Soleil BB Tinted Velvety Cream SPF 50+. This is a sunscreen designed to block out harmful UVB and both short and long -wave UVAs. Those nasty critters will ruin ya! It is only relatively recently that researchers have discovered that long wave UVA rays are not inert as was originally believed, but actually penetrate deep into the skin layers, messing with the genes in the skin cells. This leads quite quickly to dull tired looking skin and over time causes wrinkes, dark spots and saggy skin, yuck! This sunscreen is tinted to provide a little coverage for those of us who feel slightly naked going bare-faced in the sun. I usually prefer to use fragrance-free products on my face but this has a gorgeous light fresh scent that; it smells like a slightly more grown-up version of every summer you had as child and you are instantly transported to salty air and egg salad sandwiches and a sandy gusset (God I hate that word). 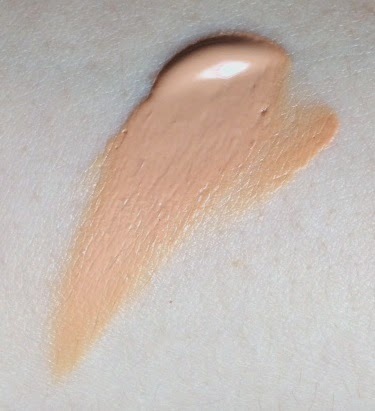 The texture is buttery smooth and a little thicker than your regular SPF cream. I was altogether unsure of the colour when I saw it first as it's quite peachy which doesn't suit my colouring usually, but it looked great when applied. Application is effortless, it blends in really well and there are no tell-tale signs that you have anything on your skin at all. It looks incredibly natural. Vichy says that it melts into your skin and this really is an apt description. So I'm going to plagiarise: it melts into your skin. There is next-to-no coverage here (although it claims to have high-coverage pigments), it's merely tinted to give a light natural tan colour which gently evens out your complexion before the sun has a chance to do its thing. My skin had a lovely glow, which is something I rarely experience. Designed for dry to normal sensitive skin this is (and feels) deeply nourishing. 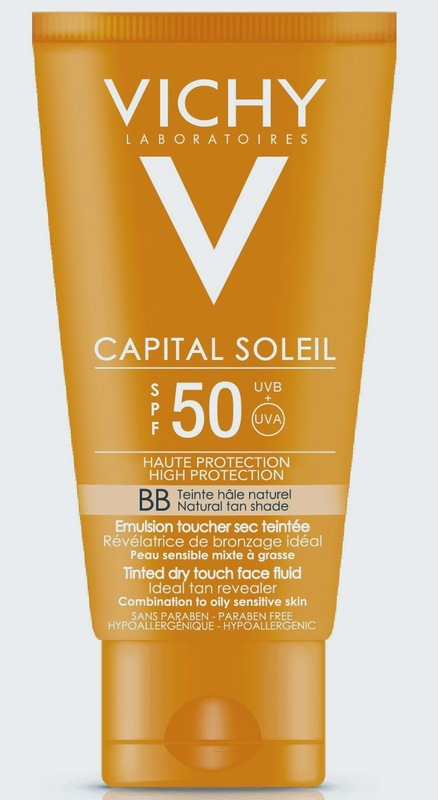 I think now that the Capital Soleil Tinted Dry Touch Fluid, the other BB sunscreen that Vichy have launched, would possibly have been better suited to my skin. My face (my t-zone in particular) was a tad too shiny for my liking from the Velvety Cream but in fairness it is usually shiny from most SPF creams, and it's nothing a little powder can't fix. So the sun has set and I'm sporting a lovely light natural tan (in between the thousands of new freckles that have cropped up) with no signs of burn or sensitivity (despite taking full advantage of the weather today), and no signs of breakout either which I was worried about seeing as it's designed for drier skin than mine. Just bright, nourished, plump, smooth skin. Delira. As for repurchasing, abso-fricking-lutley, though I may go for the dry-touch formula the next time. Retailing at around the €17 mark for 50ml you could do a lot worse with your money. The texture alone is worth it! A little genuinely goes a long way; even though you should reapply regularly throughout the day, the silky cream glides so easily over your skin that you'll find you're only applying a little at a time. For more information, visit the Vichy site here..